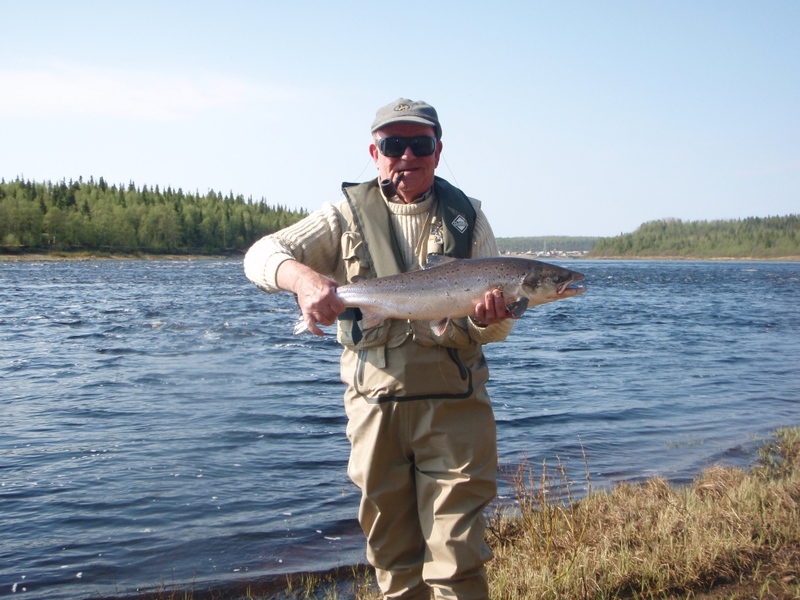 The last day of the week proved to be a very successful one with a lot of fish caught in all camps. We are going to fly to Murmansk shortly and so I will be brief but it has been the most wonderful week across all four beats with the radios crackling into life every few minutes with tales of fish being caught and lost. Pana had their best day of the week with 53 fish. Jose F-M proved that his earlier catches were no fluke as he had 20 fish for his rod. Benjamin B had a tough morning but more than made up for it with 7 fish in the afternoon including one that was somewhere between 22-24lbs. I am hoping to get some pictures from the group today and I will post some of them next week. 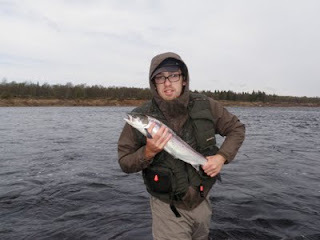 At Kitza, Hywell E had a lovely fish of around 14lbs from Sasha’s pool whilst the team had about 30 fish for the day. There are one or two rods fishing this morning trying to get that extra fish just before the helicopter arrives. 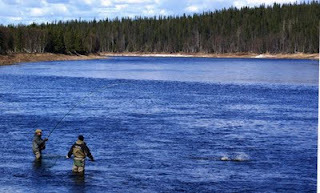 Middle Varzuga is still fishing incredibly well. 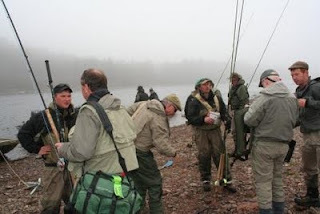 As is usually the case in this camp, a lot of the rods fish after hours and I will not know the final scores until tomorrow but they had around 130 fish for the day which puts them very near 800 salmon for the week to their 12 rods. 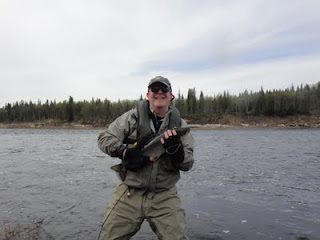 David C was one of the top scorers yesterday with 20 fish. A rare picture of my father minus a cigarette! Here at Lower Varzuga we had 49 fish for the day and Jesse went out in the evening to find that extra one to take it to a round 50 for the day. He did so in style with a fish that was probably just over the 15lbs mark. Peter H and Ian E were the top rods for the day with 8 and 9 fish respectively. It has been a great week to be up here with kind weather, plenty of fish to catch and camps full of people with smiling faces. I was down at the very bottom of our Lower Varzuga beat yesterday and saw masses of fresh fish coming in off the tide so I am very hopeful that next week will prove to be just as successful. Yesterday was a pretty dour day weather wise with rain in the morning and an overcast sky but helpfully there was no wind at all which made things easier. 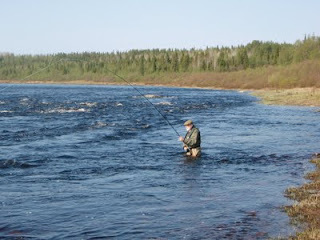 The river rose around 2 inches which can sometimes put the fish off but it didn’t yesterday. Having looked at our records of water height over the past 20 years, it is clear that despite the early break in the ice, we are around normal levels for the height of the river at this time of year and we can access all beats very easily. At Lower Varzuga Bob M, on his first trip to Russia, had a bumper day and landed 12 fish to his rod. 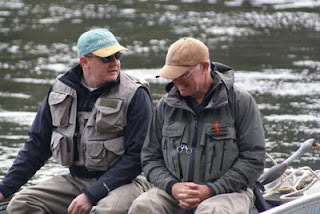 He and Peter H were fishing Heli Pool in the morning and on the opposite bank they could see Mike T and Rob W fishing the Larder pool. At one point all 4 rods were bent into fish at the same time which to my knowledge is the first quadruple hook up we have had. 3 of those fish were landed along with 48 others as we finished with 52 fish for the day. In the afternoon we were treated to the sight of supplies being brought to the camp in a less than usual way. Middle Varzuga again decided to have a very early supper and to fish in evening. They had around 110 for the day to their 12 rods but some fished very late into the night and others have got up very early this morning which has meant that Hugh has not got around to everyone to collect their final scores. At Kitza, Jeremy C and Mark M were the top rods with 10 fish each for the day. 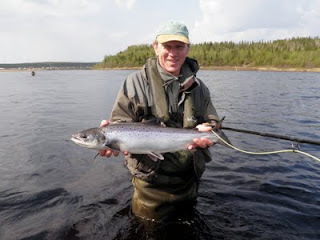 Overall they had 42 fish yesterday but it was clear that the big run, that Tom and the guides saw the day before, have yet to disperse over all of the pools as some rods caught a lot of fish whilst others had a tougher day. Up river at Pana they had a better day with 34 fish between the 8 rods. Jaime S was leading the way with 9 fish. It is Kate’s (cook at Pana) birthday today and it seems as if the clients are planning to cook their own tapas this evening as a present. I suspect that the event may be marked by the odd vodka as well..! As is often the case on the last day of the week, everyone was up early this morning and ready with all of their kit on the dot of 9am – they are all keen to make the most of the fishing before they go home and with the run of fish that we have at the moment it is easy to understand why. After another “Costa Del Varzuga” day on the river, the weather men were finally proved correct and the weather changed dramatically. At around 7pm the skies darkened and we were treated to the most extraordinary thunderstorm. Very picturesque but not exactly safe for after supper fishing with the amount of lightening that we had! 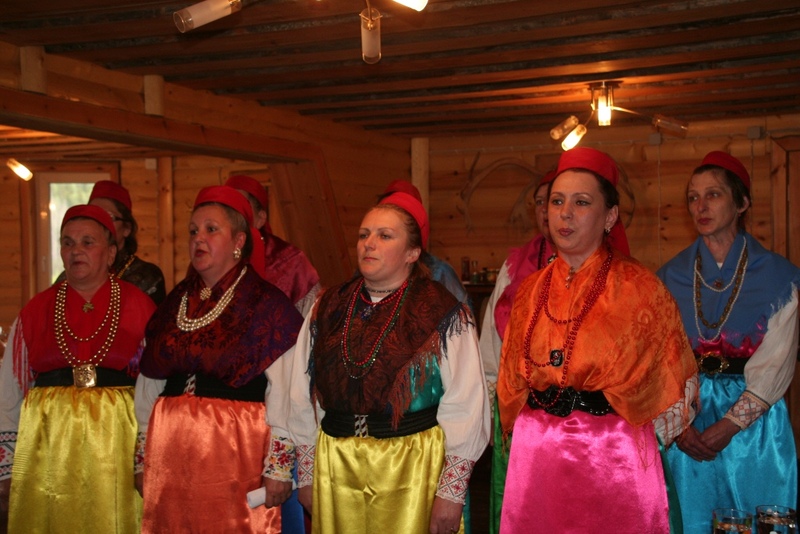 At Lower Varzuga, fishing after supper was not on the agenda anyway as we were treated to a visit from the Varzuga village choir. The 9 strong team sang beautifully, with a range of songs about men going to war, boys meeting girls and finally a charming song offering prayers to the river itself. 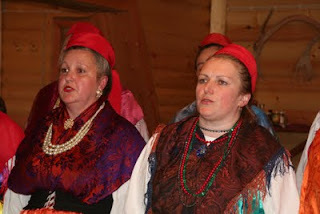 We were very grateful that they came down as they had braved lashing rain on their boat journey from the village. 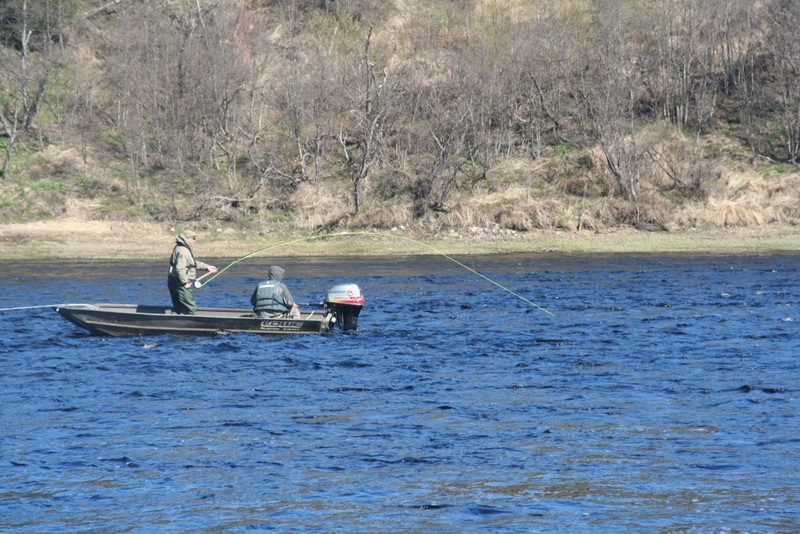 The fishing yesterday was quite tough everywhere apart from Middle Varzuga where they had a bumper day. 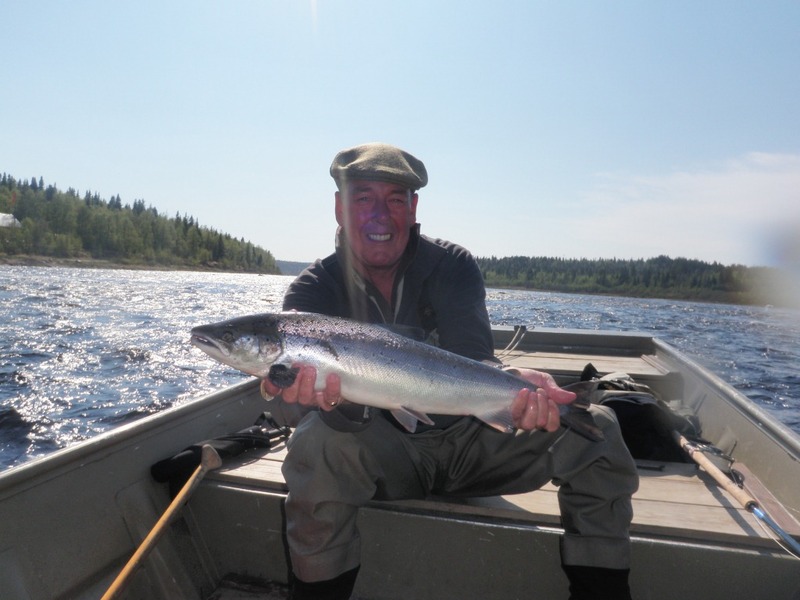 The 12 rods had 136 fish with Stewart L taking 15 salmon from Pasha’s Rest in just over 3 hours – a wonderful spell of fishing. Jeremy H lost a fish that twice took him to the end of his backing and had him running down river to try to keep up with it but eventually the fish won. In the rest of the camps the morning session was the most productive whilst the afternoon was made more difficult by burning sunshine and a very strong upstream wind. It tested even the most competent of casters but here at Lower, Alan M and Alistair W fought valiantly through it to end the day on 7 and 6 fish respectively. Mike T had a cracking double digit fish from 39 Steps which he thoroughly deserved as he was casting into a gale down there. A very respectable total of 39 fish was the tally for the day. At Kitza the team had 31 mint fresh fish with several rods deciding to call it a day slightly early in order to save their backs and shoulders. Tom, the camp manager at Kitza, said that he and the guides had seen a big run of new fish coming into the lower part of the system yesterday afternoon and we can only hope that they catch up with them today. At Pana it was slightly slower and again, the weather played its part. I know that they had 22 fish but unfortunately, slightly I suspect due to the change in atmospherics, our radio call this morning was not very clear and I could not hear any more detail than that. I will try to find out more for tomorrow. It is still raining this morning and whilst the river has dropped slightly overnight I would expect it to have risen by this evening as this rain runs off from the tundra. 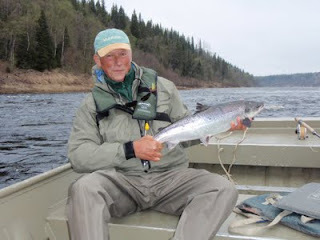 Bob M woke early today and has had 4 fish from Heli before breakfast whilst the wind has almost completely died down so I am hoping for an excellent day. Yesterday was the hottest day of the season so far and whilst the downstream wind made casting slightly harder, it did keep us cool. 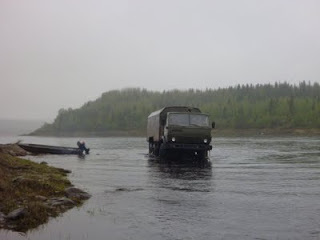 After fishing here at Lower Varzuga we all got into the helicopter to go across to Kitza camp. It was good to see those clients we had dropped off on Saturday and it was obvious from the large smiles we saw as we came into land, that the 8 rods there had had an excellent three days. 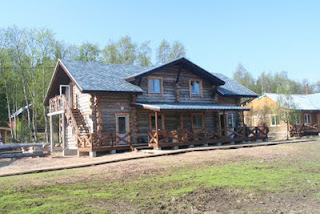 They finished their time at Kitza with 136 fish whilst the 10 rods that were fishing at Lower Varzuga tallied 156 – remarkably even fishing across the two camps. Kitza is a beautiful camp and is hard to beat and so it was nice to see the reaction of those rods, arriving here last night, to the new lodge. One of our clients, who has fished pretty much everywhere, confirms that it is certainly the most comfortable accommodation he has seen on any of the Kola rivers. At Middle Varzuga the camp manager, Hugh, decided to take action to negate the effects of the strong downstream wind. The wind tends to die down in the evening and they decided to have a very early dinner and take advantage of the softer conditions later. The plan paid off with a beautiful evening of fishing in great conditions and the 12 rods took 97 fish for the day with over 20 of those coming after dinner. 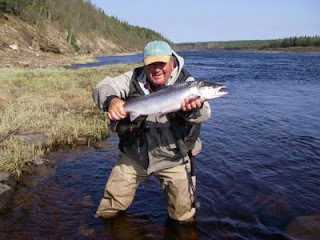 At Pana our Spanish friends continue to catch fish and to catch big fish. They had 39 for the day with Jose F-M again the top rod with 9 fish as well as a stunning 18lber. Those bigger fish run through Lower and Middle Varzuga just after the break in the ice but they are strong enough to be able to run the middle of the river and so are too far out for us to reach them. 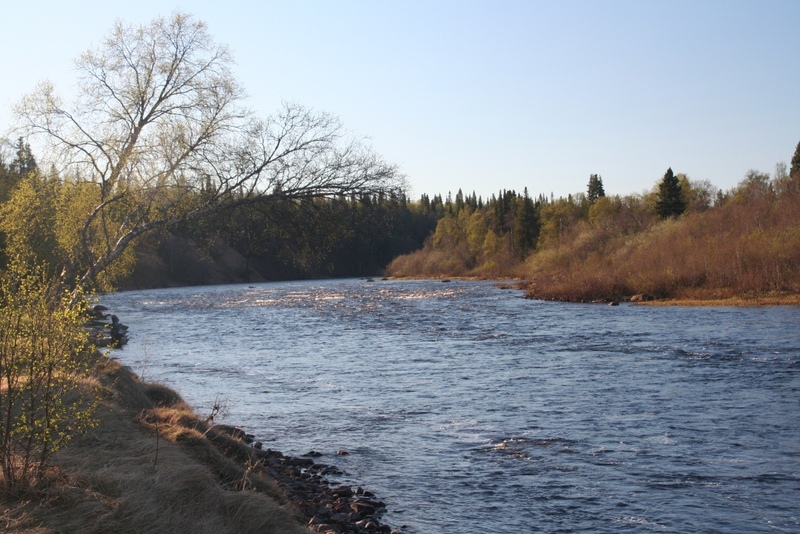 When the river narrows, as it does at Pana, we are able to cover them which is why this camp is known for its bigger fish. ﻿﻿﻿It is another very hot day today but I have just seen Alistair W take a fish out of Larder pool and so it does not seem to be affecting the fishing. The weather men said it would rain very hard this morning – it is good to see that they are as accurate here as they are at home..! When we arrived on Saturday night it was raining lightly and Sunday morning was damp and dull but it is clear that there must have been a lot more rain in the catchment area overall. From Saturday evening to this morning the river has risen by around 4-5 inches which is a huge amount for a river of this size. 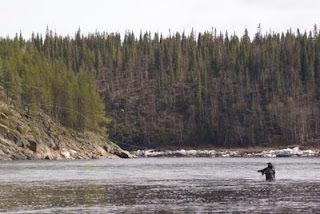 Yesterday morning was relatively difficult for all of the camps but the river levelled off by around 3pm and suddenly everyone started catching fish in the numbers that they had been on the first day. Here at Lower Varzuga we had 60 fish to the 10 rods and Ueli Z, who has been coming out here for many years, had his first ever double digit day and landed a round total of 10 fish to his own rod. The other notable feat is that we have had 3 clients land their first ever salmon - Bill D, Gwyn D and Rhodri D are all on the score sheet and continuing to land more. Kitza had another great day with 50 fish landed to the 8 rods. Ian E and Peter H were top scorers with 14 and 13 fish respectively. 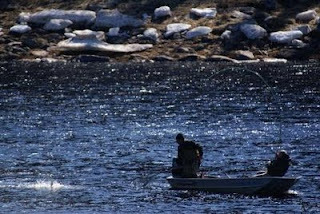 It is strange, that with such an early break in the ice, the fish should be appearing in their numbers as late in the season as this but it is good to see that the run is as strong as ever. We will fly over there tonight to do the mid week changeover and their team will be here for the next 3 days. Pana had another very good day and 35 fish were put in the book by the 8 rods with Jose F-M at the top of the charts with 9 fish. More big fish were a feature of the day and it sounded as if as many fish were lost as they were landed. 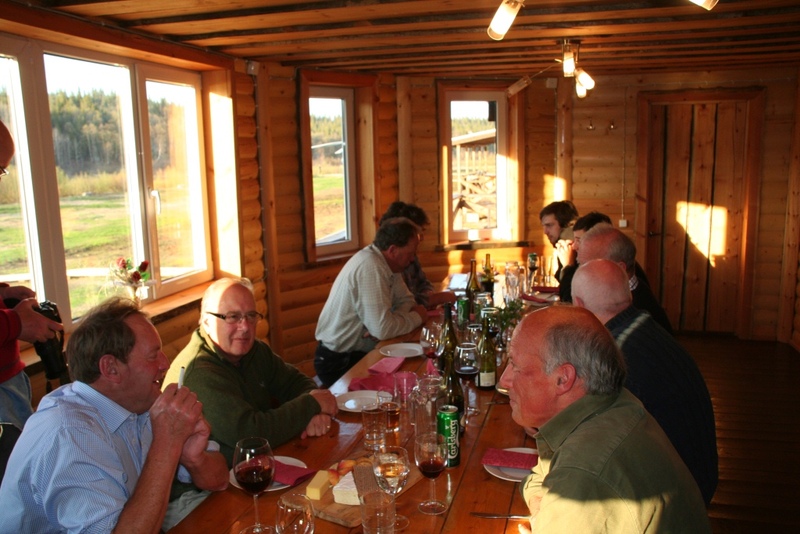 I took my father up to Middle Varzuga last night (it takes about an hour by boat) and we had an excellent dinner with the 12 rods there. Paul C and Jeremy H were the top rods on the day and they had had 15 fish each. A total of 115 fish for the day was excellent but they all felt that the strong upstream wind had probably had a detrimental effect on the overall score. It's official, the blog is bribeable - one for Janet! Sink tips remain popular but we have a very bright and warm day today, albeit with a very strong downstream wind, and it won’t be long before the sink tips prove less effective than a full floater. Yesterday morning started with thick fog and yet, as can often be the case up here, by lunchtime it was the most beautiful day. All of the carefully assembled layers of clothing were thrown to one side and everyone was trying to find their sun cream. 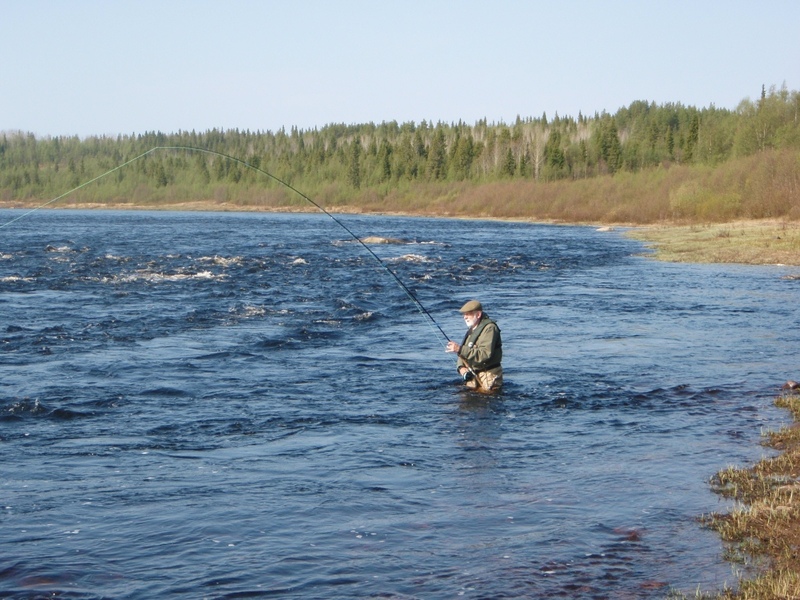 You might expect such changeable conditions to have a detrimental effect on the fishing - it was clear from the radio calls with all of the camps that this was not the case. At Kitza the 8 rods had 42 fish for the day which was a superb start and very encouraging. The water temperature has risen to 8 degrees and it would appear as if this is what the fish were waiting for. Rob W had 8 fish from Rock pool and I understand that Deluxe and Sascha’s were also very productive, demonstrating that the fish were in all parts of the river. They are still fishing with sink tips and weighted tubes but on the rest of the river we are now on floating lines with the odd person trying an intermediate tip. Fish are now coming to the skated fly but the most productive method has been straightforward doubles in size 6-8 and shrimp patterns appear the most effective. At Pana, our group of 8 had 43 fish for their opening day including a superb fish of 20-22lbs for Antonio B . Domingo P was the top rod with 8 fish and the overall opinion was that they were catching bigger fish as a rule. Most fish were over 10lbs and there were 3 or 4 up to the 16lbs mark. 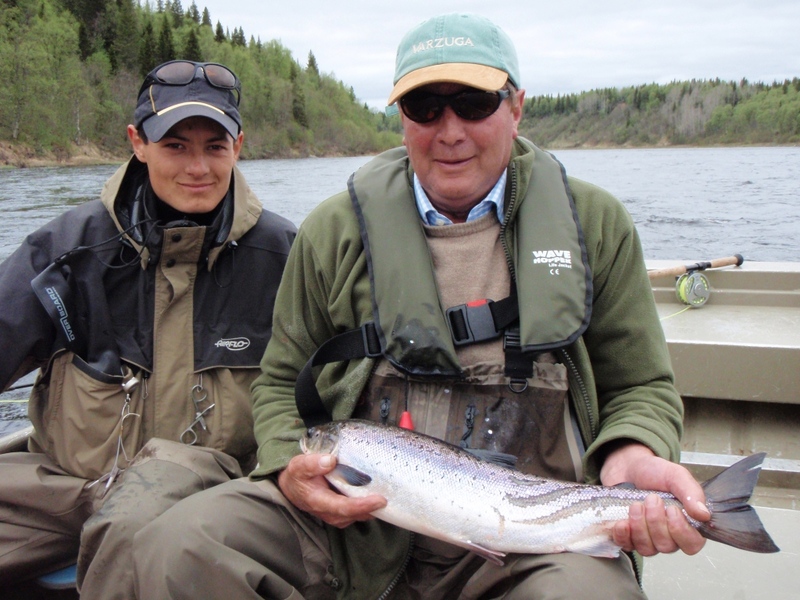 Middle Varzuga had 144 fish to their 12 guests with Stephen C leading the charge taking 20 fish to his rod. Alan S had a day to remember with an extraordinary tale of a 14lbs pike. 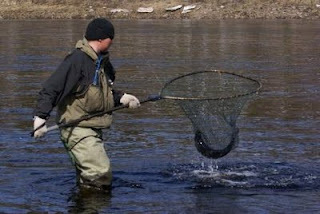 He hooked a grayling which he was busy hand lining in when the pike came from nowhere and swallowed it. He then proceeded to play the pike and the grayling and got them both in the net whereupon the pike promptly spat the unfortunate fish out – effectively making it one of the first fish we know of to have been landed without ever having a fly in its mouth! 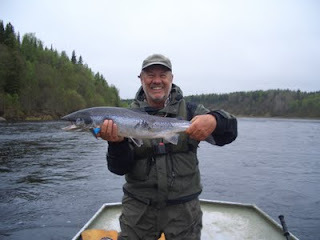 Here at Lower Varzuga our 10 rods had 55 fish for their day with Jeremy C and Mark M showing the others the way. 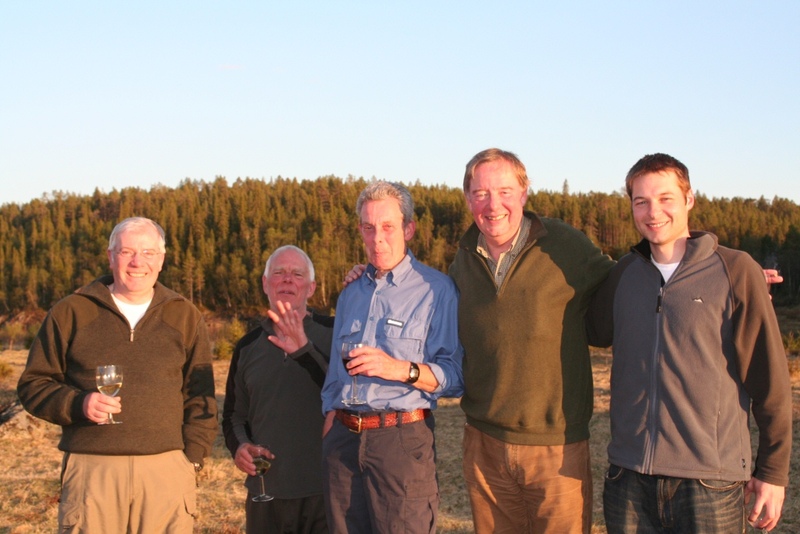 My father is out here this week and we spent a very happy afternoon catching fish, catching up and generally enjoying this very special place. Dinner last night was great fun with a room full of beaming faces and it was hard to see how the day could have been improved for anyone. All in camp and with their luggage! 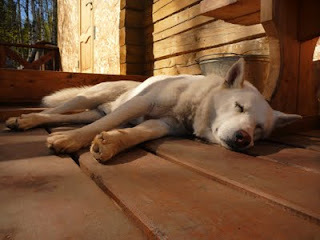 Many thanks to Christopher for updating the blog yesterday as it was a slightly hectic day. 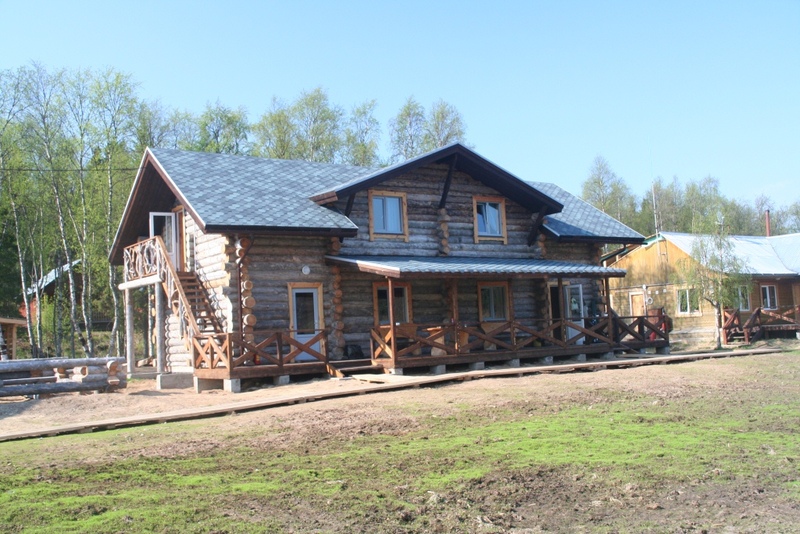 Fortunately we have an excellent partner in Helsinki, Marjalissa, who managed to persuade the authorities that, wild cat strike or not, the plane going to Murmansk had to be treated as a priority. Thanks to her, the problems that we had envisaged and made provisions for, did not come to pass. It was great to see everyone at Murmansk and it was even better to see them with all of their bags! Last week was a great week across the camps. Middle Varzuga finished with 795 fish to their 12 rods which will take some beating. 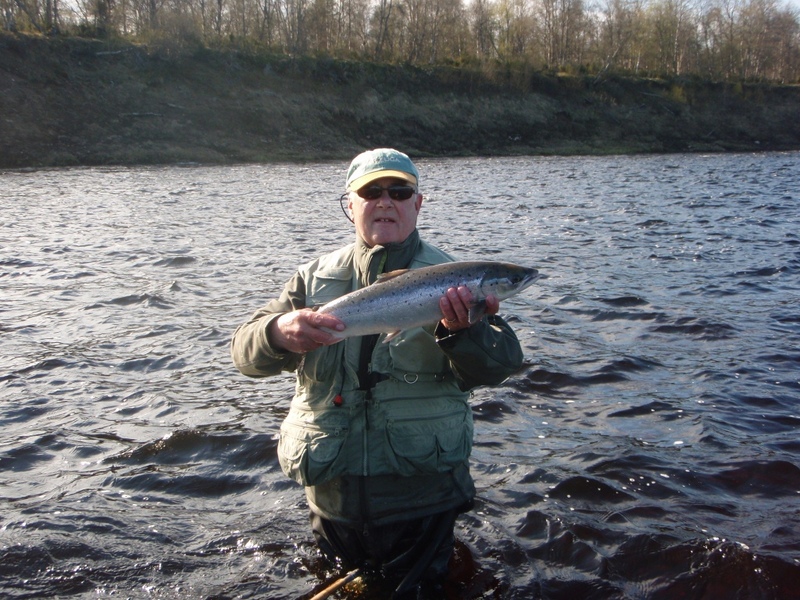 It is only fair that I point out that one of our clients had 222 fish whilst Peter W had 112 – amazing numbers of salmon in a week and demonstrates the potential of the river and the perserverance of the rods. 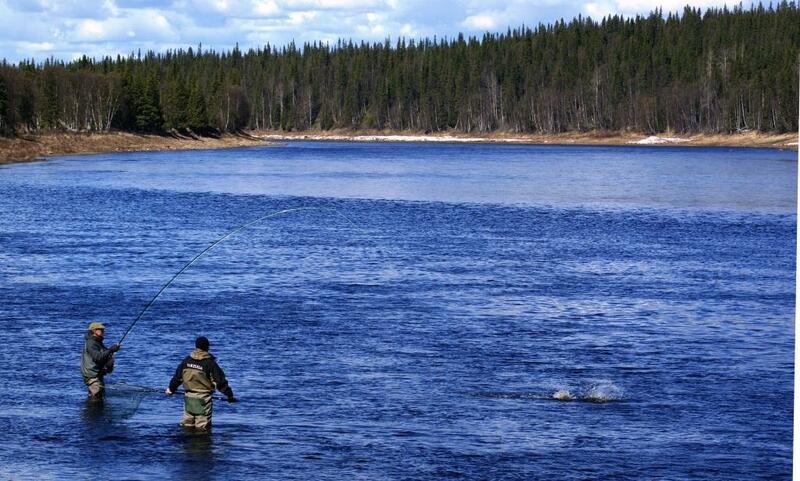 Lower Varzuga fished beautifully all week. With varying degrees of effort we had 170 fish to the 4 rods. 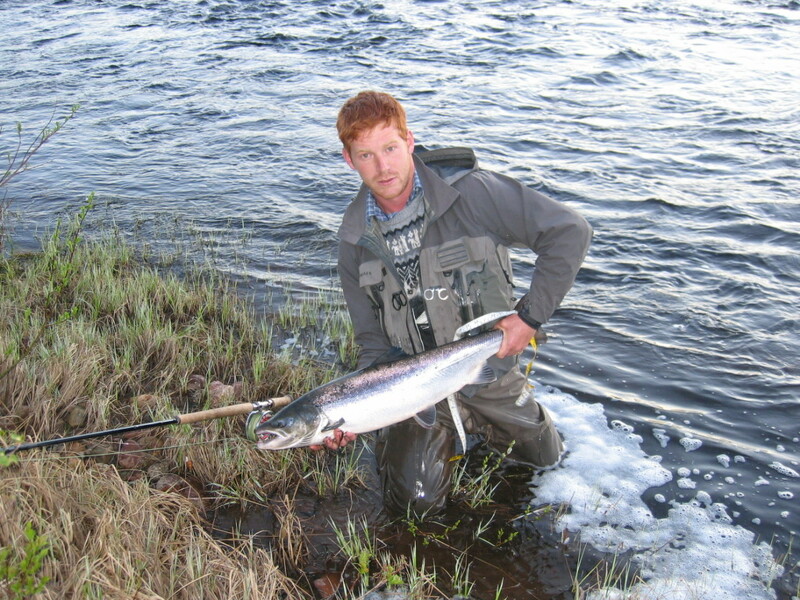 Fresh fish are still coming in and Jeremy C had 6 out of the Wires after supper last night so hopes are high for this week. Kitza was relatively slow and they finished with 65 to the 4 rods – not at all bad obviously but I had perhaps hoped for a few more. The encouraging news is that they had 7 fresh fish in just a couple of hours last night and it would appear as if the main run of fish is just starting. Our first guests are now at Pana and they also had 7 fish last night from just outside of the camp. The eight rods are all Spanish and with Barcelona’s success, I don’t think that breakfast was too early this morning! It is very foggy today but the mood in camp is bright and optimistic for the week ahead.